Fraser Residence contains 228 stylish and spacious serviced apartments that range from a 75sqm 1 bedroom deluxe layout to a 292sqm 3 bedroom premier layout. Fraser Residence gives you great views of the modern cityscape and beautiful gardens, and all apartments are lushly furnished. It is a perfect home for travelers who appreciate the finer things in life with its central location. 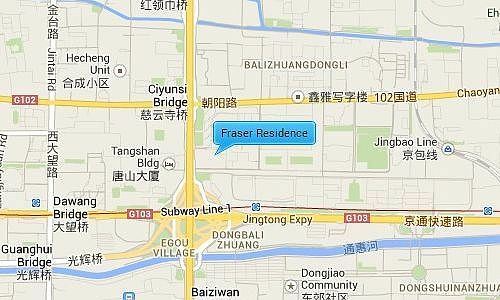 Fraser Residence is llocated just north of the Chang’an Avenue and east of the popular CBD area close to SOHO New Town and Central Place. It is next to the 4th Ring Road giving it easy access to many of Beijing’s places of interest including the Airport.